When my little one awoke with a temperature the other day, the chicken in my fridge was only ever destined for one thing: ultra-nourishing bone broth. Making broths (or stock) is one of those kitchen tasks that gives the impression of being very time-consuming and ultimately not worth the effort. This could not be further from the truth, however. Stock made with the bones of healthy, pasture-raised animals is not only useful (add it to stews, soups, sauces and grains) and more delicious than stock cubes, but also much more health-supportive. “Real stock” (for lack of a better expression) contains minerals (calcium, magnesium, phosphorus, silicon, sulfur and trace minerals) in a form the body can absorb easily. It also contains the broken down material from cartilage and tendons, like chondroitin sulphates and glucosamine, that are beneficial in treating joint pain. The gelatin found in bone broth is a hydrophilic colloid that attracts and holds liquids, including digestive juices, thereby supporting proper digestion. It also keeps hair and nails healthy. Many reasons to start adding this pantry basic to your repertoire. Place all the ingredients in a large pot and cover with fresh filtered water. Bring to a boil, and remove any scum that rises to the top, then reduce the heat to a simmer. The stock needs to simmer for at least 4 hours, but preferably 8 hours or more. 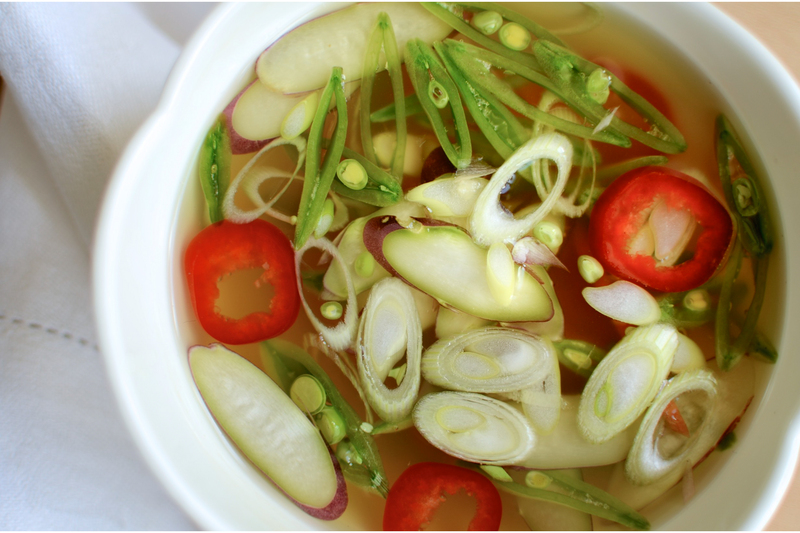 Once your stock is ready, strain it as soon as possible and use immediately, refrigerate or freeze. For a quick and tasty meal, season with salt and pepper, and add thin slivers of raw purple and green asparagus, spring onions (or salad onions), sugar snap peas, red pepper and carrot. I usually also add finely grated fresh ginger and fresh chili. Note: The vinegar helps leech the valuable minerals from the bones into the stock water.